Plot: Veronica returns to her hometown in time for her high school reunion and to help her former flame who's in the middle of a murder mystery. 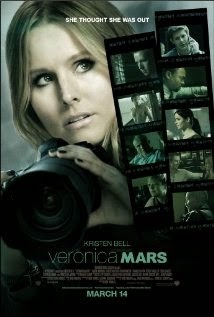 The VERONICA MARS Marshmallows are going to love this movie. Everybody else, well, it's a good flick and you'll most likely enjoy it, especially if you are a fan of mysteries and snark. It's fun, funny, entertaining and has just the right amount of romance and suspense. Plus, it's the only new thing out there this week so give it a shot. You won't be disappointed.